I may be in the minority here, but I love gift sets. I actually look forward to them during the holidays. Bath sets, BBQ sets, Movie Night sets, I love them all. There's one thing though, that I rarely see, and that's coffee gift sets. Coffee gets me through most days and I know I'm not the only one. My brother is the same way. That's why when I saw this coffee lovers set, I knew it was the perfect gift for him. The set comes with two antiqued or "aged" looking green mugs that are actually very well made and I love the old world colors. There's also a coffee scoop for those who still prefer to make ground coffee from the bag instead of the single use cups. The milk frother is something new to me. I don't drink milk in my coffee and never had a chance to have coffee with "frothed" milk, but if you love it, you'll love this great hand held one. It's light and easy to use with one button and two speeds. In addition to those items, you also get two bags of coffee/espresso flavored candies! I would have preferred them come in basket or a decorative box. They just came in the Amazon box they were shipped in (but packaged very well). Because of this, I had to purchase a basket to put them in. I also purchased a variety pack of coffee and a nice warm blanket to put in the gift basket. 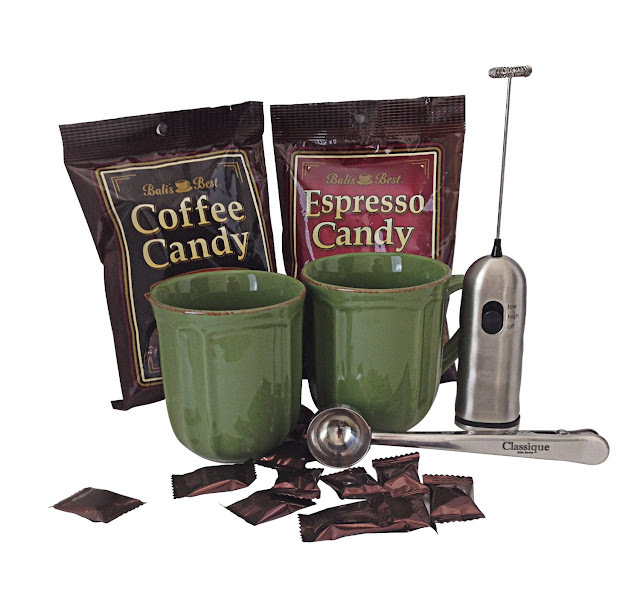 The whole set ties together nicely and is perfect for any coffee lover!